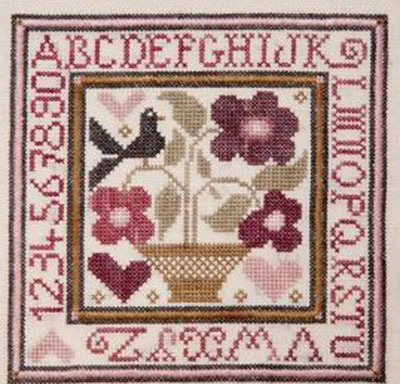 Second design of the new series "Carré"
"Carré Bouquet" is a counted cross-stitch chart with instructions translated in English. It is the second design of the new series by Tralala "Carré". Special stitches: This is a cross-stitch design with quite a lot of satin stitches (the two squares) and 8 eyelet stitches. ATALIe threads are shaded hand-dyed cotton (or silk) threads by French designer ATALIe; their subtle shading gives a special outcome to your stitching. You can buy the mini-pack of ATALIe threads we have prepared to match this pattern. See below the "related products" section to buy the right mini-pack of ATALIe threads. The model on the picture has been stitched on a 40 count linen fabric (colour off-white) using one strand of cotton over two threads of fabric for a faded effect. But you can stitch it on a lower count fabric using two strands of cotton over two threads of fabric.